Even in a fully stocked kitchen, I can’t claim to be the greatest chef in the world… But I do love good food and try to eat healthily on tour – and on the cheap. With this in mind, I thought I’d share one of Nancy’s one-pot-recipes that has helped sustain me over these last few months. 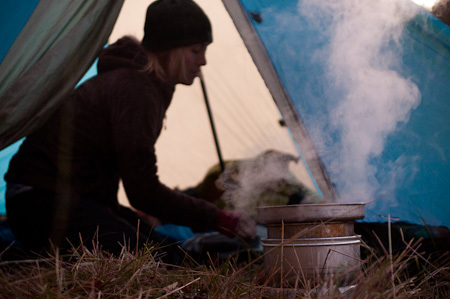 Although trickier to track down than their green brethren, red lentils are perfect camping fodder. They’re nutritious, rich in protein and cook quickly – soak them in water while you’re pitching the tent and they’ll be ready even faster. Red lentils go well with basmati rice, a high carb, slow burning whole grain. Start by putting a pot of water on to boil. Chop up some fresh ginger. Chop up some fresh garlic. If you like extra spice, chop up a little jalepeno pepper too. Chop up some carrots/sweet potatoes/brocolli, small so they cook quickly. Throw all this into the pot. Yep, at the same time. While you’re at it, add in the lentils and rice – white basmati cooks quicker. Easy, huh? Mix in some pre-prepared tumeric, coriander and cumin (equal parts), or a curry powder you’ve bought. Potter about for 20 mins, stirring occasioally. Have a stretch. Blow up your mattress. Fluff up your sleeping bag. My trangia has a nice simmer control, so won’t flay dinner to a blackened crisp if I get distracted. Serve and enjoy… After a long day in the saddle, there’s nothing to beat camping food! Haute Cuisine on the Great Divide. Make sure there’s extra liquid and mix in some cous cous at the end, and let it sit. If you chance upon some coconut milk, you can use two thirds milk/one third water for a lovely, rich flavour. Or even throw in some coconut milk powder you can find in health food shops. Similarly, I use red lentils to bulk up instant Thai Kitchen rice noodles – a lightweight, relatively healthy and flavoursome pre-prepared noodle soup, costing just a dollar each. While the water is boiling, I add the same combo – red lentils, onion and some sweet potato – mixing in the sachets too. When the vegetables are tender, add in the rice noodles for a couple of minutes. I’m a big Trangia fan – it’s a simple and reliable cook system. Previously I travelled with the complete potset, but I’ve now moved over to the far lighter and more compact Clikstand, which uses the same burner. 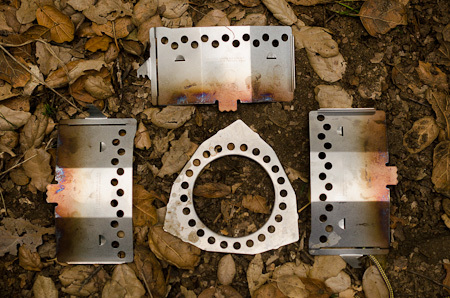 Or you can make your own, with all the tips you need over at Zen Stoves. The fuel – denatured alcohol – can be found in most hardware shops. HEET, the little yellow bottles of gas line antifreeze found in many gas stations, works well too. 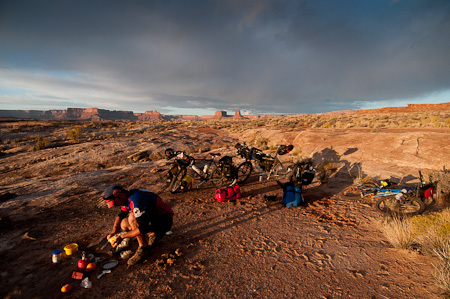 This entry was posted in Bikepacking, Recipes on February 27, 2012 by Cass Gilbert. Fry up some onions, ginger, lemon grass and chillies. Add risotto rice and stir for 1min to coat it. Add stock a little at a time and keep stiring. Once the rice is cooked and sauce gloopy throw in a small tin of crab meat and stir well. Whoops! Forgot to say that the stock is coconut milk + water…Doh! Dates + organic valencia 100% peanut butter. I have a Trangia too which is great. The only issue is when I try to put it out… I usually place an empty pot over it and wrap the cracks at the base with a wet towel to snuff out all the O2. Rubbing alcohol also works in the Trangia, down to 70%. Hey Mark. I’ve become adept at either throwing the closed simmer control over the flame, and then blowing out the residual mini flame. Or closing it with my spork, and then blowing it out. But it is a bit fiddly, I’ll admit. Does rubbing alcohol burn as hot? The 90 something percent pure rubbing alcohol burns hot, the 70% not so much. The curried lentil dish is a great one… only I use chopped chicken too. Try brown Basmati and a handful of parsley/chopped red and green peppers/ tinned Tuna/onion/garlic/sweet potato/ fresh lime or lemon and half a chopped chili. The results are delicious when you’re cold and hungry… a potato/sweet peeper omelet is also easy and filling with chunks of bread… or a THICK veggie soup which cut up small cooks to a perfect AL-dent very quickly… I’m sure you know all these tricks… must go I’m feeling hungry after your description of the red lentil rice… Bon appetite! Thanks Susie. 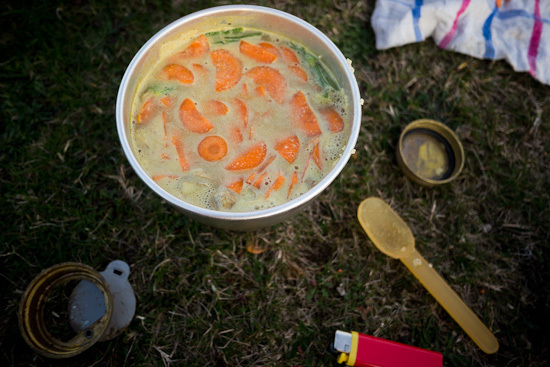 One of the things I miss most about SE Asia is the food… No need to bring a cookset there. I did meet a bike tourer once though you found it too spicy, so he carried around a giant wok strapped to his rear panniers with him! Dried Falafel mix and pita bread is great lightweight camping food. You can get as fancy or as simple as you want with the filling. Red Lentils are great, low GI => slow energy release and as you say good protein source. Can be soaked overnight to eat cold for breakfast and salids and stuff, no cooking needed. BTW when in SA, try Quinoa as a replacement for couscous and rice, great carb/protein/mineral source too. Or Chia seeds for breakfast, Omega-3’s. Both ancient Inca foods. Those ancient incas had it sorted. I’m looking forward to getting there. Great to see you’re a Trangia fan too. You might find this link useful….where to find alcohol in various places around the world. thanx for those very complete lists!